Never be in the dark again with this LED lantern! Just 1 minute of cranking the wind-up power generator will yield 20 minutes of light. Being powered by a hand crank instead of batteries or electrical outlets means this light will always be ready when you need it. 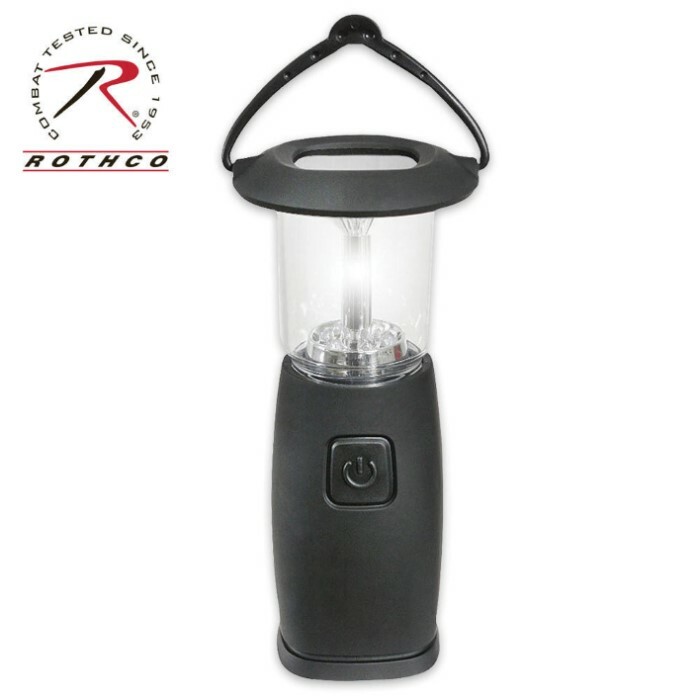 Simply crank the lantern to cast light on any situation for hours making it a must have for camping trips, cars, or just as an emergency lantern for the home. Each lantern is equipped with 6 led lights and a switch that lets the user choose either 3 or 6 lights in order to conserve battery life or just lower the light output. In addition to being wind up powered, this light features solar cells on top which can be used to charge the lantern during the day. Made from durable ABS plastic and measuring 7 1/4 in. x 3 1/4 in., it is perfect for storing in a camping pack, home closet or in a car emergency kit. Don't let this lantern's size fool you though, its powerful LED's can provide all the light you could need in almost any situation. This lantern is equipped with an NI-MH rechargeable battery that can be charged by either turning the hand crank for 1 minute, which will provide 20 minutes of light, or by setting in direct sunlight for 16 hours, which will provide 6 hours of light! This is a cool little lantern! Lasts for a great amount of time. Got this to keep near my bed in case the power goes out. its good and bright, the crank works perfectly and charges it fast. im gonna pick up a few more to store around the house! Great product charges even faster than 1 minute and even has a solar option. very compact and very light, a must for any hiker or camper. Very nice item for the price. It is a durable hard plastic case, coated in a soft rubber that provides a nice grip. Functionality is good, it does what it's meant to. Crank charger works well, haven't tested the solar function yet. I saw no noticeable difference between the 3 and 6 LED modes, at least in light output. Good product, and I will continue to buy from Trueswords!